The BHC 18 Cordless Rotary Hammer Drill. It wasn’t that many years ago when a 12V cordless power tool was the best new thing, and a huge step up from lightweight 9V drills that didn’t have the oomph to justify their presence on a commercial job site. Now, even more improved battery technologies have led to the standardization of 18V power tools. Last fall, Festool’s 18V TSC 55 Cordless Track Saw and BHC 18 Cordless Rotary Hammer Drill were named category winners by the online magazine Pro Tool Reviews in its annual innovation awards. 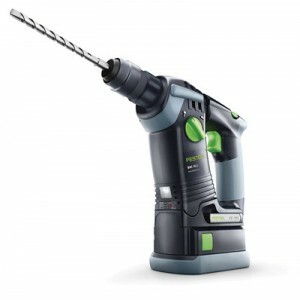 According to Festool, the $825 Track Saw is powered by two batteries, includes splinterguards to prevent tearouts, and can cut through “100 meters [328‘] of sheet goods on a single charge.” Selling for $595, the Rotary Hammer Drill has the “best power-to-weight ratio in its class,” according to the company, and comes with a dust nozzle and a range of SDS bits. The TSC 55 Cordless Track Saw. Festool USA, 400 N. Enterprise Dr., Lebanon, IN 46052 USA, tel. 765–482–4500, website www.festoolusa.com.